We are so excited to announce that the Cordoba Church Plant has placed a down payment on a church building for the Iglesia La Puerta Abierta de Córdoba, Argentina church plant! We have been renting the past ten months, and we are ready to get into a permanent structure. The location is 1/2 block from a main road, it's only three blocks from our current rented building. The building has an apartment upstairs that can function as pastoral housing. Because they have been renting, having a place for our pastor’s family to live will allow more financial flexibility for our church. This will be especially helpful when this church is fully self-sustaining. 1) Financial savings: We avoid paying rent on the church building and pastoral apartment, which increases around 20% each year here in Córdoba. 2) Room for expansion: The structure is coded to allow for the addition of multiple additional stories above the current two. That means that we could add a third story as pastor housing and convert the second story into offices/meeting rooms/children’s space to bless the church and district. 3) A permanent and fixed ministry center for this young congregation: We will be able to customize in ways that allow for the best use of the congregation. It will allow us to renovate the building and improve it in many ways, and not worry about the fact that it is a rented building and we will lose whatever investment we make when we move to a different location. 4) A place of safety in our community: The name of our church is La Puerta Abierta, which when translated means “The Open Door”. We desire to be an open door for the lost, lonely, weary, marginalized, oppressed, broken and hurting of our community. Having our own space provides for us the means necessary to be a place of refuge 24/7/365! Many of you have been praying for and supporting the work in Córdoba for almost one year. We want to say a heart-felt thank you to each and every one of you who have helped to make this dream a reality. We thank those who have sacrificially given to support our growth as a church. And we ask you to continue to pray for us and continue to support this great work! God is not finished with the work here in Córdoba, and we need people like you to stand with us! Say hello to the Córdoba Team! 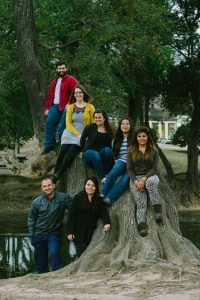 This is the group of young people that are working diligently to see the very face of Córdoba changed by the love and hope of Christ. Come alongside this movement in Córdoba and become a part of their support team today! Give to Córdoba's Mission Fund! Expansion & Partnership in Germany - We Need You!